Starting February 1, 2018, Google will require parity between canonical and accelerated mobile pages (AMP) if publishers want their content to be served as AMP in mobile search results. This is to prevent publishers from using AMP “teaser pages,” incomplete pages that require users to click to the canonical page to access the full content. While AMP is not a ranking signal, having your content in AMP features like the Top Stories carousel can increase its online visibility. The stated goal of the mandate is to improve user experience with AMP. Introduced in October 2015, the Accelerated Mobile Pages Project is an open source initiative to enhance mobile browsing experience by providing users with faster, more lightweight pages. 2 Pages with AMP HTML typically use 10 times less data and load 4 times quicker than pages without it, even when heavy features like videos, graphics, and animations are included. 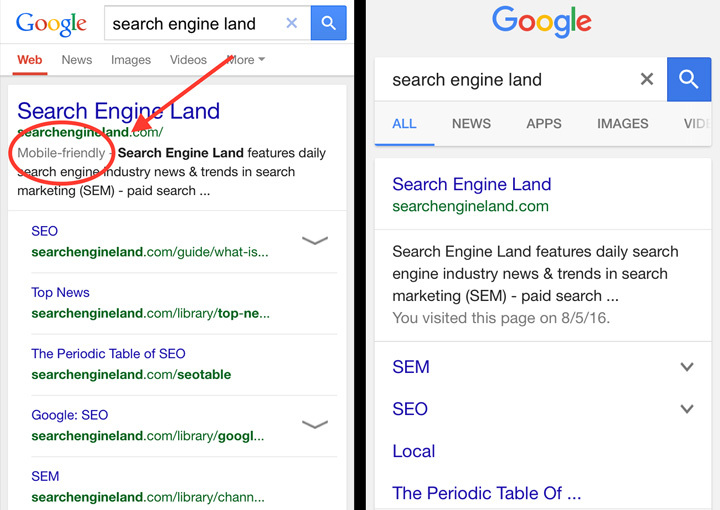 Google has since expanded support for AMP across mobile search results. What Was the Impetus for Accelerated Mobile Pages? Over the past few years, the percentage of users accessing content via mobile devices has surpassed those using desktop, and the experience Google and publishers offer mobile users can be closely tied to revenue. Why Do Publishers Create “Teaser Pages” for AMP? Some publishers might also find it easier to monetize content on their own mobile site than on AMP. This may have been the case with NBC News, which was using an AMP teaser page for its coverage of Hurricane Harvey last September. Teaser pages allow publishers to enjoy the visibility of appearing in the Top Stories carousel while also driving traffic to their sites. Forcing a user to take additional steps and time to view your content, however, could provide a poor experience. This is the reason Google gives for the new requirement that canonical and AMP content match. Considering what a large revenue source mobile search is for the company, it’s easy to see why Google is being protective of the user experience it provides through AMP. Some in the industry have also pointed out that AMP keeps users right where Google wants them: Google. Why Use Accelerated Mobile Pages? When deciding to implement AMP for your website, consider the pros and cons, as well as how the feature aligns with your specific business goals. As mentioned above, the median AMP load time is less than 1 second. In a SERP, a lightning bolt logo appears next to AMP content, alerting users they can expect to see the content more quickly than pages without it. Page speed is a ranking factor, so Google may serve AMP over conventional, slower mobile pages. Improved visibility in search results could garner more clicks on your content, even if the traffic may or may not end up on your site. Users are less likely to abandon mobile pages that load quickly. Modifying the technical back end of pages for AMP can be challenging, and improper implementation can slow them down. AMP can have fewer features than the canonical version on your website, such as logos, calls-to-action, primary navigation, and social sharing buttons. There are challenges to placing ads on AMP and revenue can be lower than if they were promoted on your own website. We’ve known for a while now that more people search on mobile devices than on desktop computers. Always prioritizing user experience, Google has responded with the mobile-friendly algorithm, the expansion of Accelerated Mobile Pages, and now with a shift to primarily index mobile pages. The company announced last week that it has begun experimenting on a small scale a mobile-first index and will fully implement this method in the coming months if it proves to provide users with a better online experience. What Does This Change Mean for Your Website? In the near future, Google’s algorithms will mainly evaluate the mobile version of your website to rank its pages, interpret structured data, and select rich snippets to show in the search engine results pages. Failure to have a mobile-friendly website could have an unfavorable impact on your website even when it’s viewed from desktop computers. Google will still index your site, but it may not rank as favorably as mobile-friendly sites. How Can You Prepare for a Mobile-Focused Index? Align the structured markup for the desktop and mobile versions of your website. Use the Structured Data Testing Tool to ensure your structured markup is consistent across the mobile and desktop versions of your website. Make sure the structured data on your mobile site isn’t superfluous or irrelevant to the content of each page. Check that Googlebot can access your mobile site with the txt testing tool. Verify the mobile and desktop versions of your website in the Search Console. Don’t rush to build a mobile site if it will compromise quality. Only launch a mobile site that you’re confident will satisfy users’ needs. Mobile is clearly the direction the public is heading in the use of online services. More than 65 percent of Americans own a smartphone, and these devices are their primary means of searching the Internet. Google is committed to accommodating users’ mobile needs—and doing the same could help the continued success of your website. To read Google’s official announcement, click here. If you’ve done the work to provide smartphone and tablet users with an easy-to-navigate website, then you probably noticed a mobile-friendly label under your URL in the SERPs. Since implementing the mobile-friendly algorithm in April 2015, Google has seen widespread compliance with its mobile-friendly criteria, and the label now appears next to 85% of sites. Customize content to fit smaller screens to prevent users from having to scroll horizontally or zoom. Ensure links are far enough apart so as to be conveniently tapped. Choose text that will be readable without having to zoom. You can utilize the mobile-friendly tool and mobile usability report to make sure your pages meet Google’s mobile-friendly design requirements and to spot any potential issues affecting your website. Popup ads that prevent users from viewing the page after navigating to it from search or while reading it. 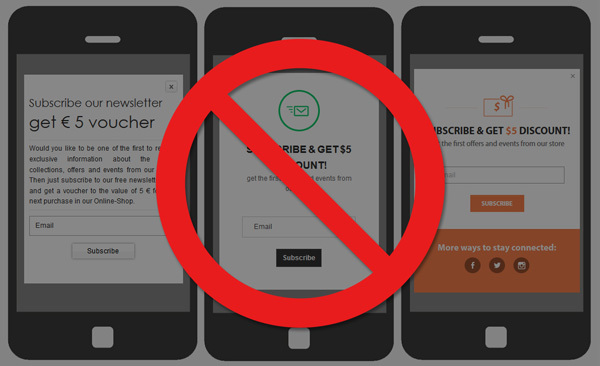 Standalone interstitials that require user action before the page can be displayed. Formatting the above-the-fold part of the page to resemble a standalone interstitial and placing the content beneath the fold. Interstitials asking users to install mobile apps (these were formally checked under the mobile-friendly test but will now be part of the new signal). The new signal won’t affect some types of interstitials and elements, as long as they are not used negligently. Legal notifications, such as agreements to cookie usage or age verifications. Login requests for email accounts, paywall-protected content, and other forms of private content. Banners that do not occupy an unreasonably distracting amount of screen space. Mobile content consumption eclipsed desktop over a year ago, and Google has acted swiftly to accommodate user expectations, first with the mobile-friendly algorithm in April 2015 and then last spring with the launch of the Accelerated Mobile Pages Project. A collaborative effort between Google, publishers, advertisers, and tech companies, the open source initiative promises to improve the mobile web experience with lightweight, lightening fast pages. 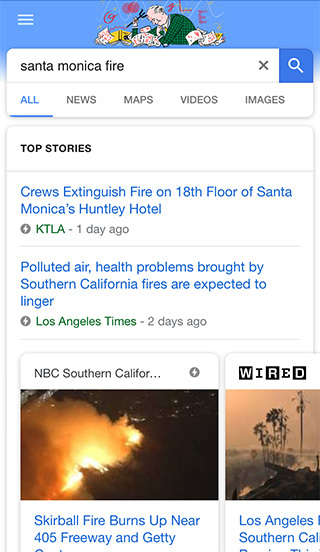 Since initially being applied only to the “Top stories” news carousel, websites from travel to entertainment have adopted AMP, and now Google plans to expand support for it across the entire mobile search results sometime this year. As is usually the case with Google, the goal of Accelerated Mobile Pages is improving the search and online experience for users—this time through speedier page load times. The company is so serious about the project that it has already indexed more than 150 million AMP documents and is adding over 4 million new ones by the week. Many of these pages are the properties of Twitter, Pinterest, WordPress.com, LinkedIn, and other major players who were quick to participate in the project. A lighting bolt logo will appear next to sites with Accelerated Mobile Pages, helping them stand out in the mobile SERPs and potentially boosting click-through rates as users opt for a faster mobile experience. AMP isn’t a ranking factor yet, but, considering the emphasis Google places on site speed, it could very well be soon. Weigh the potential benefits against the mobile-friendly version of your website. Consider the drawbacks and cost to create an AMP version of your pages. For example, since AMP HTML is fairly new, there are still page elements that will not work with the format.